For superb performance on the go, the Canon EOS 6D Mark II camera puts full-frame performance into a compact, fully featured DSLR. Its 26.2 Megapixel CMOS sensor and DIGIC 7 Image Processor help deliver amazing results even at expanded ISO settings, making it great for challenging low-light situations as well as landscape, portrait and event photography. The EOS 6D Mark II also features an impressive optical viewfinder with 45 all cross-type AF points*, fast and accurate Dual Pixel CMOS AF and a Vari-angle Touch Screen LCD for Live View operation which helps create unique angles. 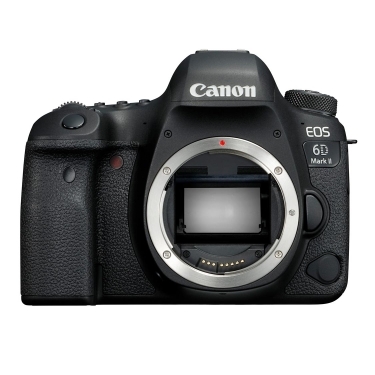 With the EOS 6D Mark II�s speed to capture action and the versatility to create phenomenal photographs and Full HD 60p videos in numerous environments and lighting situations, the camera offers creative content makers a winning combination of advanced features in a portable package that�s as fun as it is powerful.